The “but-for” investment portfolio is a tool that damages analysts may use to estimate economic damages when there is an allegation of a trustee’s breach of fiduciary duty with regard to the management of an investment. In its simplest form, the “but-for” investment portfolio estimates the value of a portfolio but for the alleged breach of fiduciary duty. Judicial precedent establishes the “but-for” investment portfolio analysis as one method to estimate economic damages on a market adjusted basis. While the concept of a “but-for” investment portfolio analysis is simple, the construction of a “but-for” investment portfolio is often complex. 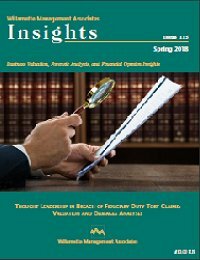 This discussion, from a damages analyst perspective, provides (1) a historical context for the “but-for” investment portfolio in case law, (2) an overview of common breaches of fiduciary duty, and (3) an examination of important areas involved in the construction of the “but-for” investment portfolio. The prudent investment of trust assets can minimize the potential for trustee fiduciary litigation risk, in addition to maximizing the trust beneficiaries’ economic interest in the trust. However, trust beneficiaries may initiate a breach of fiduciary duty tort claim when they feel that the trustee has breached any investment management fiduciary duties to the trust. For trust beneficiaries, and their legal counsel, who have brought breach of fiduciary duty tort claims against a trustee, one of the issues is how to measure the “damage” to the beneficiaries as a result of the breach. This discussion addresses the role of the investment management trustee as a fiduciary to the trust beneficiaries. This discussion then presents an analysis that legal counsel, in collaboration with a damages analyst, can use in attempting to quantify the “damage” to the trust beneficiary as a result of the investment management trustee breach of fiduciary duty. Casey D. Karlsen and Jacob Jackson, Esq. Breach of fiduciary duty tort claims often incorporate complex legal topics and damages analyses. Some of these legal and damages-related topics are summarized in this discussion. From a legal perspective, this discussion summarizes the law under which a plaintiff may seek to recover economic damages, the circumstances where lost profits may be awarded, and the effect on damages of a heightened standard of care placed on fiduciaries. This discussion then presents three methods that analysts commonly use to measure economic damages—the before-and-after method, the yardstick (or comparable) method, and the sales projections “but for” method. The power of substitution is held by the settlor of a grantor trust if this power is provided by the trust instrument. This power allows the settlor, at any time, to remove an asset or assets from the grantor trust in exchange for an asset or assets of equivalent value. Such a transfer can be problematic and vulnerable to challenge if the equivalent value is questionable. One such example is when a promissory note bearing a below-market interest rate is the substituted property. First, this discussion presents an analysis of the dispute, In re the Matter of The Mark Vance Condiotti Irrevocable GDT Trust, which involved the trustees’ refusal to honor the settlor’s request to exercise his power of substitution. Second, this discussion presents an illustrative example, with quantitative exhibits, of how complex such transactions can be and how equivalent value may be determined. One of the most ambiguous issues in multistage employee stock ownership plan (“ESOP”) stock purchase transactions is the level of control to apply in the valuation of the sponsor company shares being purchased. An ESOP trustee should carefully address this issue to ensure that the ESOP does not pay more than fair market value for the sponsor company shares being purchased. At the same time, an ESOP trustee should have a reasonable understanding of the selling party’s perspective, to allow for the best chance of completing a stock purchase transaction that is beneficial to the ESOP. Further, the ESOP trustee should ensure that the ESOP participant shares are redeemed appropriately—before and after a secondary securities purchase or sale transaction. This article is reprinted, with permission from The Journal of Employee Ownership Law and Finance, Volume 19/3. Determining any financial statement adjustments is a necessary procedure in an ESOP sponsor company appraisal. This discussion explains the common procedures for determining whether any financial statement adjustments are necessary for ESOP contribution expense. A practitioner may develop a basis for including ESOP contribution expense adjustments that best correspond with a particular set of facts and circumstances. The Internal Revenue Service (“the Service”) continues to challenge the tax deductibility of what it perceives to be excess compensation paid to closely held company shareholder/ employees. The Service often alleges that these excess compensation amounts are disguised (and nondeductible) dividend payments. When these disputes reach the litigation stage, the courts often consider the so-called independent investor test to assess the reasonableness of closely held corporation shareholder/employee compensation. Essentially, the independent investor test determines whether the taxpayer company would earn a fair return on equity (“ROE”)—after the recognition of the shareholder/employee compensation expense. Valuation analysts are particularly skilled at (1) measuring the taxpayer company ROE and (2) determining what should be considered a fair ROE for an investment in the taxpayer company. This discussion summarizes the professional guidance provided by the H.W. Johnson, Inc. v. Commissioner Tax Court decision with regard to (1) the application of the independent investor test and (2) the assessment of the reasonableness of closely held corporation shareholder/employee compensation. In income tax disputes, the federal courts often rely on the so-called independent investor test to assess the reasonableness of shareholder/employee compensation in the case of a C corporation taxpayer. In the case of Brinks Gilson & Lione v. Commissioner, the Tax Court relied (in part) on the independent investor test—but not to determine if any claimed shareholder/employee compensation was a disguised dividend distribution. Before trial, the Internal Revenue Service and the taxpayer agreed that some of the corporation’s year-end bonus payments were, in fact, nondeductible dividend distributions. In this case, the Tax Court had to decide on the application of the Section 6662 accuracy-related penalty related to the taxpayer’s compensation tax deductions. This Tax Court decision provides judicial guidance to both taxpayers and practitioners as to the determination of (1) the accuracyrelated penalty in a reasonableness of compensation tax dispute and (2) the application of the independent investor test to assess the reasonableness of close corporation shareholder/ employee compensation. In a matter that is similar to certain other recent fair value decisions, the Delaware Court of Chancery rejected a merger price indication in favor of its own discounted cash flow analysis. However, in the SWS Group, Inc., appraisal decision, instead of a decision supporting a higher fair value, the court ultimately found that the merger price was too high. This ruling highlights the risk of an arbitrage appraisal strategy and may give dissenting shareholders something to consider before invoking their appraisal rights. Also, this decision highlights how valuation analysts can sometimes arrive at significantly divergent opinions of value. The concern is that the court may view analysts as advocates for their clients—and not as advocates for their valuation opinion.